Chestnut stain brings out the beautiful grain of the cypress. The cream colored mane and tail appear to have blond highlights. 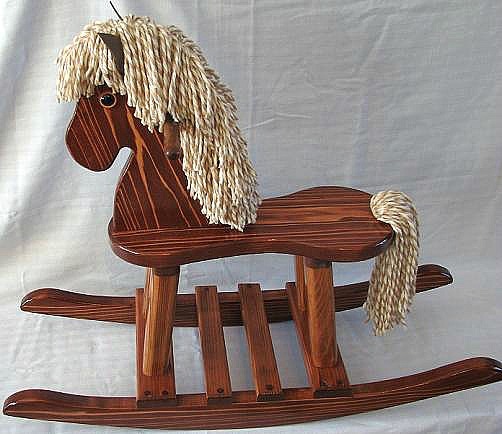 Solid wood rocking horse with a cute pony face. These are built one at a time in the Old Rebel Workshop and can become family heirlooms. The dimensions are 30" long X 23" high X 10" wide - very stable for a child as young as 1 to 1-1/2 years and the size still suits up to age 4 or more. This ready-to-ride horse is finished with a red chestnut stain over solid cypress wood. The cypress shows a real variety of grain patterns and colors with this stain. You can see the button eyes and the pointy ears. Added center cross pieces on the rockers make it easier for a younger child to get a great ride. And the 30" rockers mean an older child will still enjoy it.